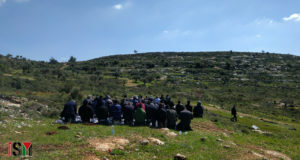 Israeli settlers uprooted more than 150 olive and grape trees from Palestinian-owned land in Wadi Abu Ar-Rish, near the settlement of Bat Ayin, south of Bethlehem, on Monday, witnesses said. Settlers from Bat Ayin also set fires in the same area. Witnesses said that the settlers carried out these attacks under the protection of Israeli soldiers. 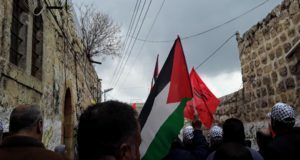 The municipal government of the town of Beit Ummar, under whose jurisdiction the land lies, issued a condemnation of the assault, and also called for an investigation. Last Friday, Israeli soldiers assaulted Palestinian and Israeli peace activists who held a demonstration in the same area. Seven protesters were arrested. Bat Ayin is known as one of the more militant settlements in the West Bank, and has been a flashpoint for recent violence. 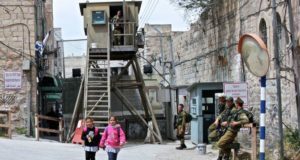 A group of Israeli settlers known as the “Bat Ayin Militia” were convicted for an attempt to bomb a Palestinian girls’ school in 2002. In April a Palestinian man also killed a teenage settler with an axe near Bat Ayin.